Deputy Prime Minister Honourable Sam Condor has saluted nine local employees at Ross University for taking a courageous step forward in their efforts to fulfill the demands of a transforming economy in St. Kitts and Nevis. Cyndie Demming, Charles Wentworth, Julienne Rawlins, Floyd Revan, Alison Stewart, Collin Williams received their Masters from DeVry University â€“ which the locally based Ross University is affiliated with â€“ in various areas, including human resource management, information systems, business management and accounting. Cheryl Cumberbatch, Avonelle Fahie and Iona Halliday-Simmonds earned Bachelor Degrees in information technology, health services management and technical management. Also receiving a Bachelors in Technical Management was Cyndie Demming. The students were beneficiaries of the DeVry Tuition Benefit Programme, which offers employees at any affiliated institutions to pursue an online education free of cost. That benefit also extends to spouses and dependents. Deputy Condor, who holds the portfolio for Education, said the growth of a society needed persons who posses analytical and professional skills that can provide logical and creative solutions to the many challenges confronting nations in an increasingly globalised world. He called on others to join with the fifty enrolled students taking part in this DeVry initiative. 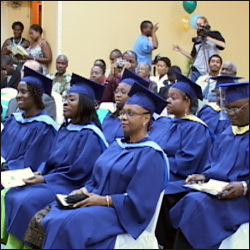 The university was credited for introducing this â€œforward looking ventureâ€ and Minister Condor explained that the presence of the institution brings esteem to the educational landscape of St. Kitts and Nevis and tangible advantages to locals. â€œWe believe that the benefits that accrue to our economy, and country, and people are manifold and we are genuinely grateful for this,â€ Minister Condor stressed, noting that the Government takes pride and satisfaction, in the fact that St. Kitts and Nevis continues to be a favored destination for quality offshore education.